At the NCAA Division III Indoor Track and Field Championships, that type of thinking almost did in David Benjamin. 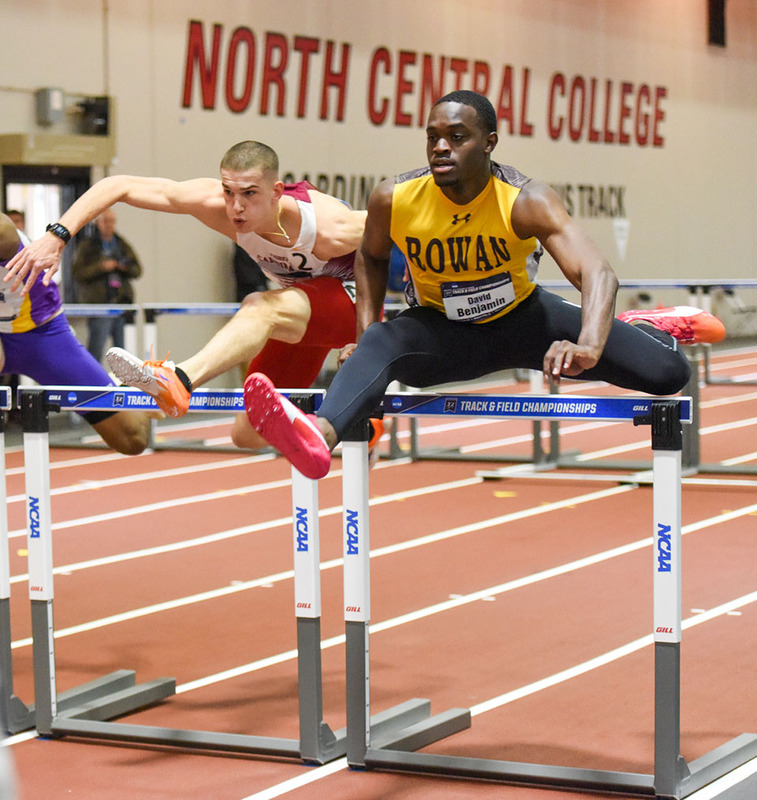 Instead, Benjamin cleared his head and ran a Rowan- and facility-record time of 7.98 seconds to win the 60-meter hurdles at the national championship meet in Naperville, Illinois, on March 11. The junior said he just relaxed after putting a lot of pressure on himself the first day of nationals. 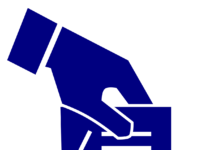 He placed sixth in the event’s preliminary heat. This marked Benjamin’s second time earning a trip to the indoor championships. 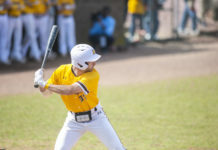 For the Brookdale Community College transfer student, it isn’t the success at Rowan but how rapidly he’s reached it that has been a pleasant surprise. A mix of nerves also hit Benjamin’s teammate at nationals, Jeffrey Tucker. The fellow junior found relief from what might give others more worry: competing in multiple events. Tucker embraced the competition of the high jump – his central event – and the long jump, going on to earn All-America honors for both. “Having two events, I was more confident going into this year than I was any other year I went to nationals,” Tucker said. Competing in the long jump on the national stage for the first time, he took third with a mark of 23′ 3.50”. On day two, Tucker came in fourth in the high jump after tying with three others for the win but losing in a tiebreaker section. According to Men’s Cross Country and Track and Field Head Coach Dustin Dimit, the last jump was the best of Tucker’s career. “He’d never been that high in the air before and his spikes just grazed [the bar] coming down,” Dimit said. “They [both] handled themselves like upperclassmen. They really went after it. We’re really proud of how they did,” he added. Benjamin and Tucker were joined at the championships meet by teammate Harrison Escoffery, who took ninth in the high jump, missing the last All-American spot in a tiebreaker. 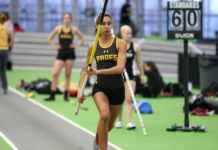 Representing the women’s side, freshman Angel Rowe had a school-record distance of 38′ 0.75″ in the triple jump for 10th. Out of the 65 programs that registered points at nationals, the Rowan men tied for sixth place (21 points) in the team scoring. The Rowan track and field teams already began the outdoor season, getting ready to compete in their second meets this weekend. At the season-opening Emory Invitational (March 17-18), Benjamin helped the men’s squad to their second-consecutive win of the annual meet by taking first in the 110 meter hurdles.